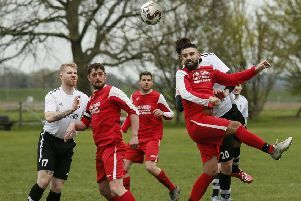 Kent Athletic took a huge step towards the SSML Division Two title by beating rivals Hale Leys United 4-2 on Tuesday night. The hosts scored through Rhys Calvano, Jason Penman, Connor Waite and Jack Magill to all but end their opopnents title hopes and move four points ahead of second placed Old Bradwell United with just three games to go. On Tuesday, Athletic were 6-2 winners at Loughton Manor. Pat Daly scored another brace, while Penman, Deon Putnam, Matthew Terry and Waite all netted. Old Bradwell United thumped The 61 FC (Luton) 5-0 on the same evening, while Totternhoe stayed seventh with a goalless draw at second bottom side Clean Slate. Kent travel to Grendon Rangers this afternoon, while Totternhoe host Loughton Manor on Saturday and face Hale Leys in the Division Two Cup final on Monday, the same day The 61 FC (Luton) head to Tring Corinthians.